Michael Whitney Straight, the youngest child of Willard Straight, an investment banker, and Dorothy Payne Whitney Straight, an heiress, was born in New York City on 1st September, 1916. His father died of septic pneumonia in 1919. Later his mother married Leonard Knight Elmhirst, a British educationist who founded Dartington Hall school in Devon. Straight was educated at the London School of Economics and Trinity College. While at Cambridge University he became friends with John Cornford, Kim Philby, Guy Burgess, Donald Maclean and Anthony Blunt. Straight joined the British Communist Party after the death of Cornford in the Spanish Civil War. Theodore Maly became a NKVD officer and joined other "illegals" such as Richard Sorge, Walter Krivitsky, Leopard Trepper and Arnold Deutsch working in Europe. Adopting the name Paul Hardt, he was sent to London to build a spy network. Senior MI5 agent, Peter Wright, pointed out: "They were often not Russians at all, although they held Russian citizenship. They were Trotskyist Communists who believed in international Communism and the Comintern. They worked undercover, often at great personal risk, and traveled throughout the world in search of potential recruits. They were the best recruiters and controllers the Russian Intelligence Service ever had. They all knew each other, and between them they recruited and built high-grade spy rings." Maly recruited Kim Philby, Donald Maclean, Guy Burgess, John Cairncross and Anthony Blunt as spies. They were instructed to join right-wing political organizations such Anglo-German Fellowship as Maly knew this is where British intelligence recruited agents. Maly also used his agents to check out other potential spies. For example, Burgess was asked to provide a report on Straight. "Michael Straight, whom I have known for several years... is one of the leaders of the party at Cambridge. He is the party's spokesman and also a first-class economist. He is an extremely devoted member of the party... Taking into account his family connections, future fortune and capabilities, one must suppose he had a great future, not in the field of politics but in the industrial and trading world.... One may reckon he could work on secret work. He is sufficiently devoted for it, though it will be extremely difficult for him to part with his friends and his current activities." In June 1937 Anthony Blunt introduced Arnold Deutsch to Michael Straight. Deutsch reported: "Straight differs very much from people we have dealt with before. He is a typical American, a man of wide-ranging enterprise, who thinks he can do everything for himself.... He is full of enthusiasm, well-read, very intelligent, and a perfect student. He wants to do much for us, and, of course has all possibilities for this.... But he also gives the impression of being a dilettante, a young guy who has everything he wants, more money than he can spend, and therefore in part who has a restless conscience.... I think, under experienced guidance, he could achieve a lot. However, he needs to be educated and to have control over his personal life. It is precisely contact with people in his future profession which may turn out dangerous for him. So far, he has been an active member of the party and constantly surrounded by his friends." Maly was concerned with Straight's links with the Communist Party of Great Britain. For example, he had been giving the party newspaper, The Daily Worker £1,500 a year? Maly approached Harry Pollitt and asked him for approval of the move from open to covert communist work. Pollitt agreed but refused permission for Straight to stop giving money to the newspaper. In fact, the following year it was increased to £2,000. Anthony Blunt introduced Straight to spy chief, James Klugmann, who ordered him to return to America, although he was in line to become president of the Cambridge Union. Roland Perry, the author of The Last of the Cold War Spies: The Life of Michael Straight (2005), has argued that Joseph Stalin wanted Straight to be groomed as a future President of the United States: "According to Yuri Modin, the most successful KGB control for the Cambridge ring, Straight was viewed as a potential top politico - a long-term 'sleeper' candidate. Stalin and the KGB would always be prepared to support and guide someone for however long it took to get an agent into high office, even the White House. In many ways, Straight was the near-perfect candidate. He was a dedicated communist, now moving into KGB agency, with all the right credentials for high office. Straight had the family background in Washington politics, not to mention Wall Street. He had independent wealth, a near-essential prerequisite, and his skills were outstanding. His height - 6'3" - and good looks would win votes too, especially in the United States where Hollywood images were beginning to impinge on the political arena. The politics he espoused would have to be packaged to make them digestible to a majority vote. Yet he could always slip in under the guise of a liberal democrat, who had matured away from his wayward youth in faraway Cambridge, England." After returning to the United States in 1937, Straight worked as a speechwriter for President Franklin D. Roosevelt and was on the payroll of the Department of the Interior. Klugmann put him in touch with KGB agent, Iskhak Akhmerov, who introduced himself as Michael Green. He provided material to Akhmerov but this was of little use to the Soviet Union. Akhmerov reported that Straight “does not yet provide authentic materials, but only his notes,” which are out-of-date. In 1940, Straight went to work in the Eastern Division of the U.S. State Department. After the United States entered the Second World War Straight joined the United States Army Air Forces as a B-17 Flying Fortress pilot. In 1946 Straight took over as publisher of his family-owned The New Republic magazine (his parents had established the magazine with Walter Lippmann and Herbert Croly in 1914). Straight appointed the leading left-wing politician, Henry A. Wallace as editor of the magazine on a salary of $15,000 a year. Wallace wrote that: "As editor of The New Republic I shall do everything I can to rouse the American people, the British people, the French people, the Russian people and in fact the liberally-minded people of the whole world, to the need of stopping this dangerous armament race." Wallace formed the Progressive Citizens of America (PCA). A group of conservatives, including Henry Luce, Clare Booth Luce, Adolf Berle, Lawrence Spivak and Hans von Kaltenborn, sent a cable to Ernest Bevin, the British foreign secretary, that the PCA were only "a small minority of Communists, fellow-travelers and what we call here totalitarian liberals." Winston Churchill agreed and described Wallace and his followers as "crypto-Communists". In January 1948, The New Republic reached a circulation of a record 100,000. Michael Straight was unhappy with Wallace's involvement of the Progressive Citizens of America and his collaboration with the American Communist Party. Straight was a supporter of the Marshall Plan and the anti-communism policies of President Harry S. Truman and therefore decided to sack Wallace as editor. Straight became editor until resigning in 1956. He was replaced by Gilbert A. Harrison. Straight now concentrated on a literary career. His first book, Trial By Television, was an attack on McCarthyism. He also wrote several historical novels about the American West. This included A Very Small Remnant, about the Sand Creek massacre of 1864, and Carrington, about the Fetterman Massacre, where Captain William J. Fetterman and an army column of 80 men were killed by a group of Sioux warriors in December 1866. In 1963 Straight was offered the post of the chairmanship of the Advisory Council on the Arts by President John F. Kennedy. Aware that he would be vetted - and his background investigated - he approached Arthur Schlesinger, one of Kennedy's advisers, and told him that Anthony Blunt had recruited him as a spy while an undergraduate at Trinity College. Schlesinger suggested that he told his story to the FBI. Straight's information was passed on to MI5 and Arthur Martin, the intelligence agency's principal molehunter, went to America to interview him. Straight confirmed the story, and agreed to testify in a British court if necessary. Christopher Andrew, the author of The Defence of the Realm: The Authorized History of MI5 (2009) has argued that Straight's information was "the decisive breakthrough in MI5's investigation of Anthony Blunt". Peter Wright, who took part in the meetings about Anthony Blunt case, argues in his book, Spycatcher (1987) that Roger Hollis, the Director General of MI5, decided to give Blunt immunity from prosecution because of his hostility towards the Labour Party and the damage it would do to the Conservative Party: "Hollis and many of his senior staff were acutely aware of the damage any public revelation of Blunt's activities might do themselves, to MI5, and to the incumbent Conservative Government. Harold Macmillan had finally resigned after a succession of security scandals, culminating in the Profumo affair. Hollis made little secret of his hostility to the Labour Party, then riding high in public opinion, and realized only too well that a scandal on the scale that would be provoked by Blunt's prosecution would surely bring the tottering Government down." Blunt was interviewed by Arthur Martin at the Courtauld Institute on 23rd April 1964. Martin later wrote that when he mentioned Straight's name he "noticed that by this time Blunt's right cheek was twitching a good deal". Martin offered Blunt "an absolute assurance that no action would be taken against him if he now told the truth". Martin recalled: "He went out of the room, got himself a drink, came back and stood at the tall window looking out on Portman Square. I gave him several minutes of silence and then appealed to him to get it off his chest. He came back to his chair and confessed." 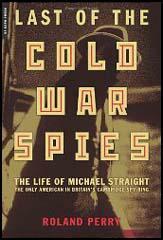 He admitted being a Soviet agent and named twelve other associates as spies including Straight, John Cairncross, Leo Long, Peter Ashby and Brian Symon. Straight later served as the deputy chairman of the National Endowment for the Arts from 1969 to 1977. 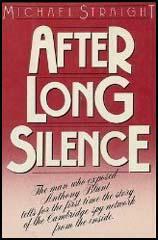 In 1983, Michael Straight detailed his communist activities in a memoir entitled After Long Silence. He admitted that while working for the Department of the Interior he passed on reports to a Soviet handler he called "Michael Green". He later insisted he had not provided anything that "contained any restricted material". However, according to TD: "But six years later the KGB released his file which showed that, using the codename 'Nigel', he had sent telegrams, ambassadors' reports and political position papers from the State Department." According to Richard Norton-Taylor: "Straight's marriages to Belinda Crompton and Nina Auchincloss Steers, a writer and stepsister of Aristotle Onassis, ended in divorce. His third wife, Katharine Gould, a child psychiatrist, survives him, as do five children from his first marriage." Michael Whitney Straight died of pancreatic cancer at his home in Chicago, Illinois, on 4th January 2004. Hollis and many of his senior staff were acutely aware of the damage any public revelation of Blunt's activities might do themselves, to MI5, and to the incumbent Conservative Government. Harold Macmillan had finally resigned after a succession of security scandals, culminating in the Profumo affair. Hollis made little secret of his hostility to the Labour Party, then riding high in public opinion, and realized only too well that a scandal on the scale that would be provoked by Blunt's prosecution would surely bring the tottering Government down. Burgess's note for Maly added that Straight's "status in the party and his social connections are very significant. The question was whether to begin to act, when and how." Burgess assigned Straight the code name "Nigel" (later he was called "Nomad"). Maly instructed Burgess to act. He in turn asked Blunt to lure Straight into the espionage net. Michael Straight, whom I have known for several years... is one of the leaders of the party at Cambridge. He is the party's spokesman and also a first-class economist. He is an extremely devoted member of the party... Taking into account his family connections, future fortune and capabilities, one must suppose he had a great future, not in the field of politics but in the industrial and trading world.... One may reckon he could work on secret work. He is sufficiently devoted for it, though it will be extremely difficult for him to part with his friends and his current activities. Blunt wondered if the United Kingdom was the best place for him. He painted a bleak picture of England as a declining - nation, which had been a refrain of his and of Burgess's ever since they had first discussed international politics. Blunt suggested Straight's talent for politics, oratory, and public speaking as well as his economic training would be better put to use for the cause in the United States, which was ; destined to play a far larger role in world affairs. At 20, Straight was too young for politics. However, Blunt was aware : that the Moscow Center, and Stalin, considered Straight a possible long - rerm prospect as a politician in the United States. According to Yuri Modin, the most successful KGB control for the Cambridge ring, Straight was viewed as a potential top politico - a long-term "sleeper" candidate. Stalin and the KGB would always be prepared to support and guide someone for however long it took to get an agent into high office, even the White House. In many ways, Straight was the near-perfect candidate. He was a dedicated communist, now moving into KGB agency, with all the right credentials for high office. Straight had the family background in Washington politics, not to mention Wall Street. He had independent wealth, a near-essential prerequisite, and his skills were outstanding. His height - 6'3" - and good looks would win votes too, especially in the United States where Hollywood images were beginning to impinge on the political arena. The politics he espoused would have to be packaged to make them digestible to a majority vote. Yet he could always slip in under the guise of a liberal democrat, who had matured away from his wayward youth in faraway Cambridge, England. Maly, the Comintern, and the Moscow planners were shrewd. Before Straight could even contemplate a political career, they had decided he should use his economics and family connections to establish something substantial while he was still too young for the hurly-burly of Washington and backroom wheeling and dealing. Why not in his father's old Wall Street firm, J. P. Morgan? Why not, Blunt suggested, become a banker? This was not what Straight had expected. Blunt was urging him, or directing him, to go into international banking like Willard Straight. But the young Straight had no interest at all in such a profession. When he expressed this, Blunt became adamant. The mutual connections, which Straight was led to believe was the Comintern, and above it, Stalin himself, were giving him an order. Michael Straight, who has died aged 87, was the scion of a patrician American family, a former editor of the New Republic magazine and perhaps the most reluctant member of the Cambridge spy ring, centred around the secretive circle known as the Apostles, which included Kim Philby, Guy Burgess, Donald Maclean and Anthony Blunt. As a student in the mid-1930s, Straight was enlisted by Blunt, who later became surveyor of the Queen's pictures, to work for the communists, and therefore for the Soviet Union. His university friends included Tess Mayor, who later married Lord Rothschild - who was also to be accused of being a member of the notorious spy ring - and who helped to expose Philby, Burgess and the prominent communist James Klugmann. Blunt had approached Straight at a time when the American was emotionally vulnerable, as well as politically impressionable, after his close friend, the poet John Cornford, had been killed in the Spanish civil war. Many years later, Straight's own admissions led to the unmasking of Blunt. In 1963, Straight was offered a post as adviser on arts endowment with the Kennedy administration in Washington. Aware that he would be vetted - and his background investigated - he approached Arthur Schlesinger, one of Kennedy's advisers, who suggested he reveal all to the FBI. He was subsequently interviewed by MI5. After being given immunity from prosecution, Blunt confessed everything. He was finally named in public - and stripped of his knighthood - in 1979 by Margaret Thatcher, who told the Commons that the information that had led to his confession was not "usable as evidence on which to base a prosecution". This was challenged by the former MI5 officer Peter Wright, who said that Straight had stated that Blunt had recruited him as a spy for Russia, not simply as a member of the Communist party. However, Straight is likely to have insisted that he must, on no account, be named as a witness in any trial of Blunt. That would certainly have suited the British establishment, which was determined to try and keep Blunt's treachery under wraps.